A lot of us sit all winter thinking about all the things we might do to the boat in the spring, although many of those projects never seem to get started once the weather improves. Two Whaler Montauk owners decided to update their boats this winter by adding an engine setback bracket. Here is a look at these refitted Montauks and the results of the modifications. "Because of your site, the discussions on setback plates, and your super reference article on engine brackets, I decided to add one to my 1974 Montauk. "Here are a few more pics to add to your collection. A 'before' shot, a 'during' shot with the engine suspended from a tree limb, and an 'after' shot showing the bracket, new Doel-Fin, and 'new' Stilleto prop (that I purchased used from kingfish). The 'after' was taken the next day in my very cluttered garage. What you don't see in the 'during' is the large limb wrapped a couple of times with a 6' length of 1/4" chain and the shackle. The jackplate is an 8" Rite-Hite that I purchased on eBay. 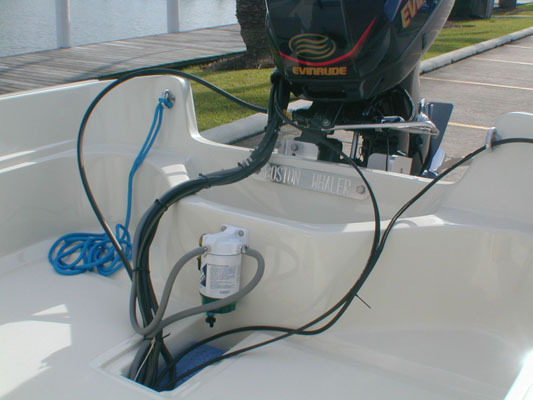 I also added a transom support plate and had to replace the fuel line with a longer one." To begin the process of installing a new engine setback bracket, the boat is strategically manuevered under a stout tree limb. 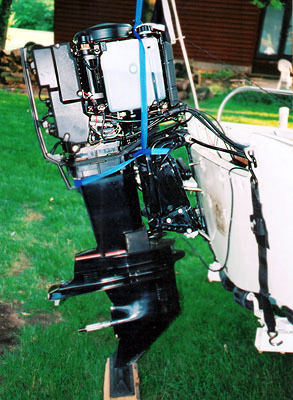 With the tree providing an overhead support, the engine is unbolted from the transom. The skeg is blocked up to bear some of the weight, too. For a few critical moments the engine hangs suspended. The boat is moved forward, and--hopefully--the bracket slips right into place. Don't forget to reseal the transom bolt holes! The finished installation. The engine is set back from the transom on the adjustable bracket. A new stainless steel propellor should also help improve performance. To transfer some of the load to the trailer, a support brace has been installed for trailering. 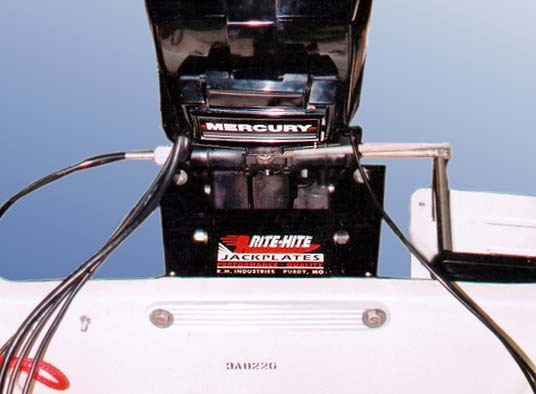 The black bracket with red trim goes beautifully with the original engine color scheme! 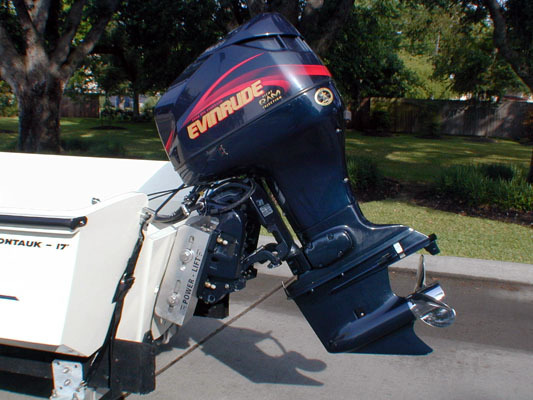 Besides the anticipated improvements in performance, moving the engine aft on the bracket cleans up the transom area. "As a kid I grew up running around in a 11-foot Whaler my family had as a dinghy to our cruising boat. 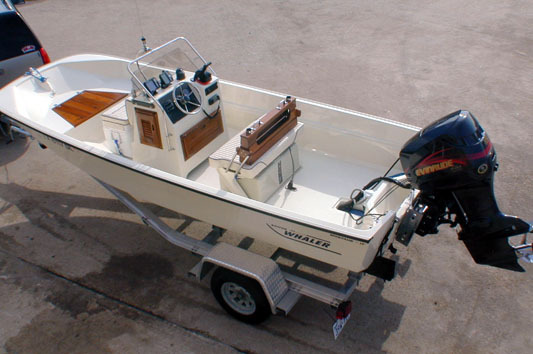 The first Whaler I actually owned was a 1978 13-Sport which was featured on Cetacea Page 24. 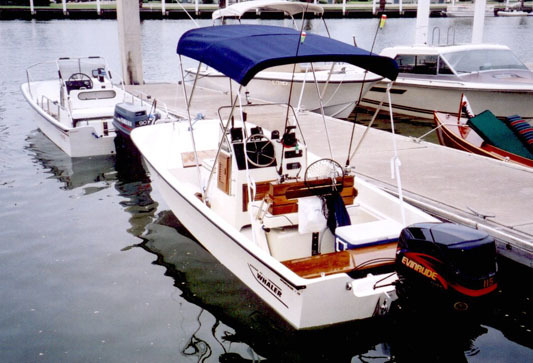 "My wife and I recently moved up to our next Whaler, a 1986 17-Montauk. 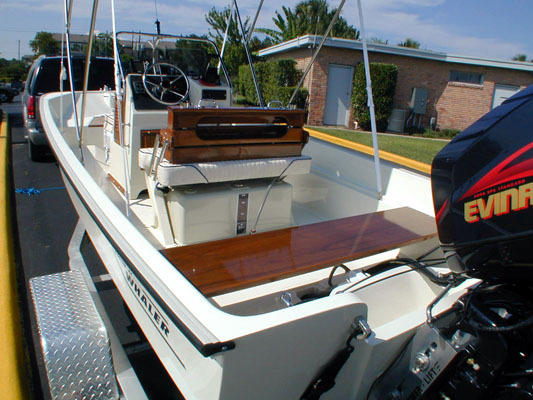 We mainly will use the boat for cruising and fishing around the Galveston Bay, Texas area. The 17 proves to be a nice upgrade from the 13 for available space, comfort of ride and overall versatility. "I have spent many a night working in the garage on my new restoration project project which has recently been completed. The Montauk is now in "like new" condition. I would certainly like to thank all of the folks on continuousWave for their insight and ideas. "Something you may notice is that I chose not to place the rails back on the boat. The bow rail would definitely be in my way when fishing plus it would rattle alot. The side rails I may place back later on, but it sure is nice being able to sit on the gunnels, etc. "I have also: rechromed my bow light/chock, applied 8 to 10 coats of Epifanes varnish to all wood, repaired and Awlgrip painted my aluminum RPS legs. "The 115 Ficht weighs 362 pounds and has logged only 11 hours so far, but I certainly find it more than adaquate. 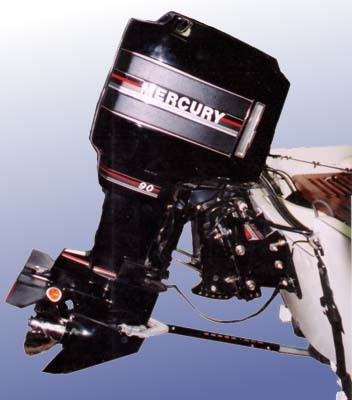 The engine is quick starting, quiet running and just sips fuel compared to the carbureted 2-strokes. The GPS shows the boat will do 20 knots @ 3000 RPM and 41 knots @ WOT, which is 5700 RPM (5750 is the maximum rated crankshaft speed)." 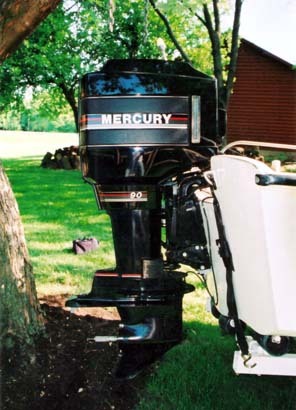 This clasic Montauk has been repowered with a new 115-HP Ficht engine mounted on a jack plate. The rest of the boat received equal attention and refitting. In all, a wonderful job has been done! The restoration of this Montauk has been accomplished with outstanding skill. Everything on this boat just gleams! A RACOR fuel-water separator/filter has been added to the fuel system. The engraved transom mounting panel is a nice detail. Has your boat ever been this clean? Two Montauks side-by-side allow comparison of the static trim. The heavier engine and aft mounting with bracket have put the stern down a bit and the bow up on Rex's boat. The fuel tank is full and so is the cooler, including ice and two trout. This static trim change will need less engine trim when on plane, better aligning the engine thrust and perhaps producing some higher top speeds. The page has been accessed 116227 times.